THE NATIONAL UNION of Rail, Maritime and Transport Workers (RMT) has initiated an electoral alliance for the European elections that will be contesting all of the seats in England, Wales and Scotland in the elections on 4 June. 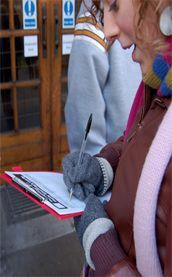 This is a temporary platform for the European elections, entitled No2EU-Yes to Democracy, with initial support from the RMT, Socialist Party, Solidarity�Scotland�s Socialist Movement, the Indian Workers� Association, the Communist Party of Britain (CPB), the Morning Star newspaper, the Socialist Alliance, the Campaign for a New Workers� Party and others. The Campaign for a New Workers� Party�s steering committee urges all CNWP members to support No2EU-Yes to democracy. This is the first time since the formation of the Labour Party that a trade union has taken an electoral initiative on an all-Britain scale. The transformation of the Labour Party from a workers� party at base � albeit with a capitalist leadership � into an unalloyed party of big business has left the working class without a mass party for well over a decade. The absence of such a party has been a central factor in holding back the confidence of workers to struggle in defence of their pay and conditions. The fact that the RMT has taken this step, however tentative, is therefore enormously positive. The candidates for No2EU-Yes to Democracy include leaders of the Lindsey oil refinery construction workers who went on strike in January and of the Visteon car components workers currently blockading their factories. Bob Crow, general secretary of the RMT, will be heading the list in London, and a number of RMT regional officers will be standing around the country. Coventry Socialist Party councillor and CNWP chair Dave Nellist heads the list in the West Midlands. In the North West, the regional UNISON NEC representative and CNWP secretary, Roger Bannister, is heading the list. In Scotland, Tommy Sheridan is second on the list. Other candidates include car workers fighting job losses, postal workers resisting privatisation, health workers, teachers, fire-fighters and other public-sector workers. This list offers an alternative to the pro-capitalist parties, and its candidate lists are dominated by some of the most combative sections of the working class in Britain today. The campaign is partially motivated by an understanding of the urgent need to provide an alternative to the far-right racist British National Party (BNP). There is a real danger that the BNP could capitalise on the anger with New Labour and succeed in winning one or more MEPs in this election. The BNP will never be cut across by bland campaigns pleading with people not to vote for racists. The implication of such campaigns is that workers should vote for the pro-capitalist parties in order to stop the BNP. Only the development of a genuine working-class alternative, combined with a serious campaign against the BNP, will be able to effectively undermine them. This electoral initiative is taking an important step in that direction by offering a left, anti-EU alternative. The programme of No2EU-Yes to Democracy is limited. Nevertheless, it seeks to oppose the European Union (EU) from a working-class, non-nationalist standpoint. The EU has not been central in most workers� minds up to the present time. However, recent developments have made it more of an issue, at least amongst those workers who have been directly affected, and perhaps increasingly amongst a wider layer. It was central to the Lindsey construction workers� strike. It was under the EU Posted Workers Directive and subsequent European Court of Justice (ECJ) rulings that the Italian-registered company, IREM, was able to employ workers not covered by the union-enforced national construction industry agreements. No2EU�s programme takes up the different aspects of the EU�s neo-liberal laws. These laws arise from the support of this government, and all European governments, for neo-liberal anti-working class policies. EU laws provide them with an additional lever with which to drive through their pro-big business programmes. For example, the EU's public spending criteria gave New Labour an excuse to privatise capital projects like new schools and hospitals, by means of private finance initiatives and the disastrous public-private partnership on London Underground, which increase the costs of public services and subsidise corporate profits. The government�s plan for the part-privatisation of Royal Mail, the first step to its complete sell-off, is linked to the EU�s 2007 Postal Services Directive to introduce a deregulated postal services market. In Britain we do not yet have a new mass left party � or a significant step towards one such as exists in Germany, France and Greece. However, we are faced with an important beginning. We have the leadership of a militant trade union that is prepared to take the responsibility for initiating the development of a political voice for working people � at least in the European elections � that will oppose all the capitalist parties and provide an alternative to the far-right, racist BNP. They will undoubtedly face attack from the capitalist media for daring to stand up. All those who are serious about building a new mass workers� party should offer every assistance in ensuring the campaign is a success.